Let's talk writing tools to boost productivity! The Neo2 is a portal word processing device with a full-size keyboard, long battery life, small screen (similar to a graphing calculator), and limited controls. It easily connects to the computer and transfers all your work to the word processing software of your choice. The Neo2 is perfect for distracted free drafting and squelching that inner editor. Even though the Neo2 is no longer in production, the manufacturer still supports it. But that means you'll have to settle for a used or refurbished device. On the bright side, you can snag one for under $50 on Amazon. My output has dramatically increased in the short time I've been using the Neo2. And it's continuing to increase the more I use the device, which is why the Neo2 is my favorite writing tool. The only other comparable device on the market is Freewrite. Freewrite does have some added perks and features--like syncing to Google Docs, Dropbox, or Evernote--but it's also significantly more expensive at $549. There's something about brainstorming and plotting with pen and paper that stirs creativity. However, most of my notes eventually get discarded, and all that paper adds up. Enter Rocketbook. This reusable notebook provides a writing experience similar to a standard notebook while reducing the amount of paper that ends up in the trash. A standard executive-sized Rocketbook is available on Amazon for around $30. The Rocketbook comes with a Pilot Frixion pen and a microfiber cloth. The pen's eraser is great for minor corrections, but the microfiber cloth is best for erasing entire pages. To clear an entire page, just dampen a corner of the microfiber cloth, erase the page, and then use a dry portion of the cloth to wipe it clean. That's it. The Rocketbook is similar to a product called the Elvin Notebook. I researched both products before ultimately choosing the Rocketbook, and it was this well-done review comparing the two that helped me decide: https://www.amazon.com/gp/customer-reviews/R2CM15OADIJZPF. Having resource books close at hand might be the first thing that comes to mind when the Kindle is mentioned. But it's not the only use. The Kindle is also useful for reading projects with fresh eyes after multiple rounds of edits and rewrites have blurred your vision. 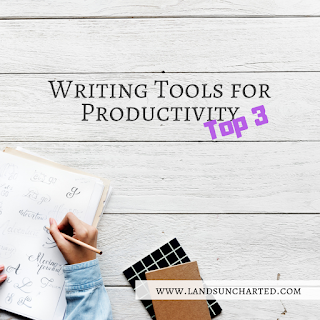 What tools or approaches have helped you boost your productivity?